Garden Photo of the Day: Has this ever happened to you? I will never know what this flower is (unless someone out there recognizes it) or where it came from. I'm thinking that it is some member of the mallow family. It's not a hollyhock, although it has some of the same characteristics. One June day almost twenty years ago, I ventured into the lower yard, which had never really been landscaped, and here was this charming flower. It stood about four feet tall, came up from a basal rosette on the ground, and going up the stalk were white flowers with red centers. This photograph was taken after its prime, but you can get an idea of what it looked like. I was thrilled and had every intention of gathering seeds, once the blooms were over. 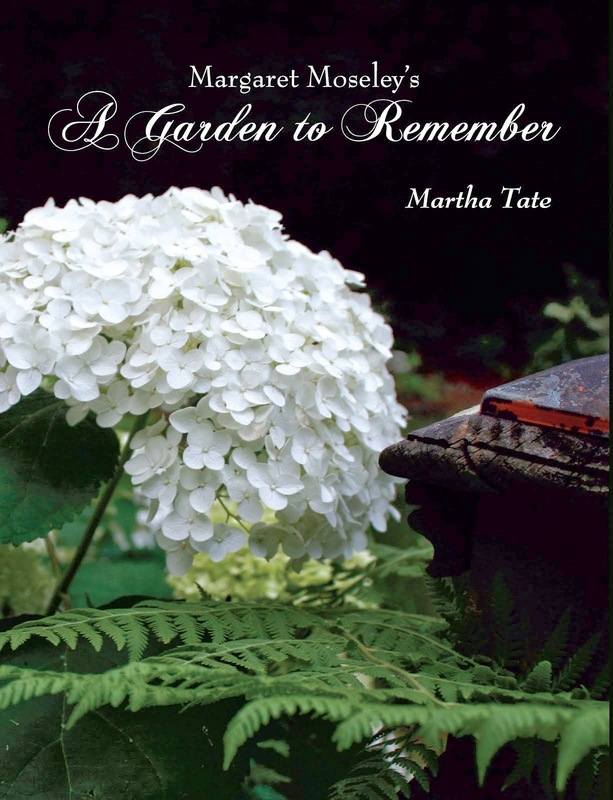 I even fantasized about introducing the flower for cottage gardens. First, though, I had to go out of town on a scouting trip for A Gardener's Diary (to Wisconsin; I have a story about that, as well, involving a ghost; will get to that at a later date). When I returned home a week later, I rushed down to see if the seeds were starting to dry. But wait. Where was the flower stalk? And the basal rosette of leaves? The whole area, after having been neglected for probably 10 years, was neat as a pin. What happened? For the first time ever, my husband had bought a weed eater. Here we were, with four acres of strangling wisteria, privet choking out the creek bottom, pokeweed rising up everywhere and a thousand scrubby sweet gums becoming too tall to pull up. They were all intact. Nothing else had been done on the whole property. Just this patch where the flower had grown. I frantically looked for any part of the stalk. But no, for the first time ever, my husband had actually picked up the debris left behind. The flower was gone forever. Recently, I've hit another spate of things like this happening. Probably 25 years ago, lightening hit a tree up at the little house (stripped it like a candy cane). The tree eventually fell, leaving a six foot tall trunk that looked like petrified driftwood. Every year, I thought how perfect it would be for a Carolina jasmine. So, this year, Karen Villano dug up part of her vine and gave it to me. I brought it home and went up immediately to plant it. What? Was I hallucinating? The tree trunk was gone. Not there. I went over and saw it had been chopped down, literally to the ground. How could this be, after all these years, on the very day I had the perfect vine for it? A yard helper had brought a friend along who must have craved a workout with an axe. I'm sure they both thought they had done me a great favor. Okay. Allow me just one more story (even though this type of thing has happened to me many, many times). I came home from church on Sunday to check on some guys who were fixing the brick porch at the little house. I almost fainted. Gone were three 15 foot tall hollies. They weren't my favorites, but they had been there forever and had provided definition to the corner as you come into the parking lot. And, what else was missing? More hollies and further down the hill two giant elaeagnus plants that I used for church greenery. They were the only two on the property without bad thorns, and their foliage was actually quite attractive. Any of the others could have been cut, and I wouldn't have cared. The culprit was a teenager who accompanied the workmen. I looked around at all the privet and wisteria, and yet again, the poke weed - all standing in good form. There were a million chores I would have had him do if I'd known. None of this is tragic, but it does happen a lot. I'm not too upset about anything really, but I can't ever forgive my late husband for cutting down that flower. I don't think he ever used the weed eater again. It just sat there and rusted. My favorite was the guy who was hired to work in our front yard pulling weeds. Left ALL the weeds, but for some unfathomable reason, pulled up the Southern shield ferns in the flower beds. When asked WHY he did that, he responded: "Oh, don't worry. I didn't really do a very good job, and they should come back up." Makes it REALLY hard to pay someone, much less TIP them, under those circumstances. 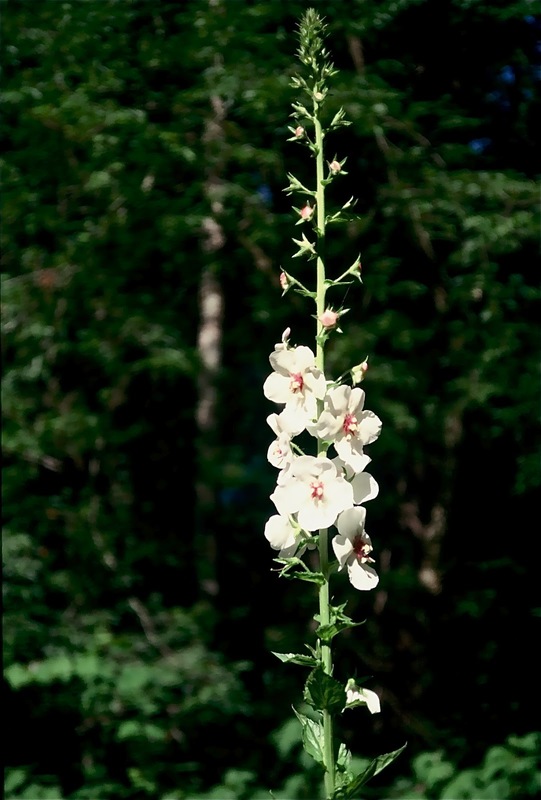 Elizabeth Dean, a well-known plantswoman and nursery owner says it is Verbascum blattaria. I googled it, and she is correct. She says I should forgive my husband, as some people consider it a weed. It was a very lovely weed, though, and would look great in a cottage garden. Not at all like the fuzzy-leaf giant verbascum (which I love). I was convinced it was more akin to a hollyhock. But you are right! It is a verbascum! Thank you so much for commenting. Is there some kind of deviant gene that causes a person to see undesirable plants as desirable and worthwhile shrubs as something to be hacked to the ground? I had to laugh at your hubby story which reminded me of something similar that happened to a friend of mine. On a trip to Arizona she purchased one of those rusted metal sculptures of a howling coyote for her garden. One day when she got home from work her husband proudly showed her how he had sanded and painted her coyote a beautiful, bright silver. She was nice and didn't say anything. And over the years he regularly repainted her sculpture. I was thinking it was a verbascum as well...like Verbascum chaxii or blattaria. I grow the chaxii, and it is a spectacular architectural spire, that at least in Charleston thrives in light shade. True perennial too. Seedscatterer - I think you're onto something! Nancy - That is so funny about the (now) bright silver coyote! Reminds me of borrowing a weathered teak bench for a display. When the bench was delivered, it had been pressure washed and now the color of yellow varnish. It looked terrible with all our flowers. The people were so proud that they had cleaned it for us. Jess - You are right! It is the latter. V. blattaria. I would never, ever have guessed. I do love verbascums. To Suellen: Just set up e-mail on my I-Phone. Saw your comment from May 31 about hydrangeas. Somehow the Blog didn't register your comment about not being able to grow hydrangeas. I wonder where you are that Annabelles won't grow (unless they're eaten by deer like mine are). Anyway, I hope you see this. I know people in the upper Midwest have trouble growing the macrophyllas (they get killed by cold each year), but H. arborescens 'Annabelle' should work just about anywhere (maybe parts of Florida). Annabelles bloom on new wood, like the paniculatas do. In Ga., we prune in late winter to encourage new growth. On the macrophyllas, we don't prune, except for maybe after blooming. Who knows about those? This story reminded me of the summer after I first planted a row of daylilies along the front of my property. One day while I was working in my study at the back of the house, I became aware that the sound of my neighbor mowing his lawn had become much louder. It turned out that, having finished mowing his own lawn, he decided to help me out by driving his rider mower up our shared dirt road and mow my front yard, too. I ran outside and jumped up and down in front of him waving furiously and trying to get him to stop as he mowed down all my just-about-to-bloom daylilies. He just grinned and waved back; he thought I was waving to thank him!